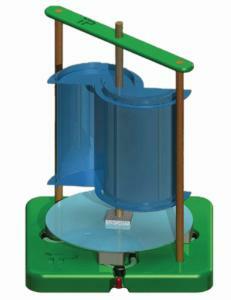 Explore wind energy in this inventive vertical turbine design. Its simple format allows you to create free, renewable energy with a spin or by holding it to the wind, yet its incorporation of technology allows for limitless customization and green energy research. With a strong-yet-lightweight injection molded components, its features include plastic s-foil wind blades which capture wind from all directions, and a build-it-yourself alternator to product electrical current with the option to customize with additional coils and magnets. The built-in LED light helps to indicate the generated power. Ideal for grades 5 through college. Size (assembled): 204mm x 145mm x 145mm; Weight: 23oz.